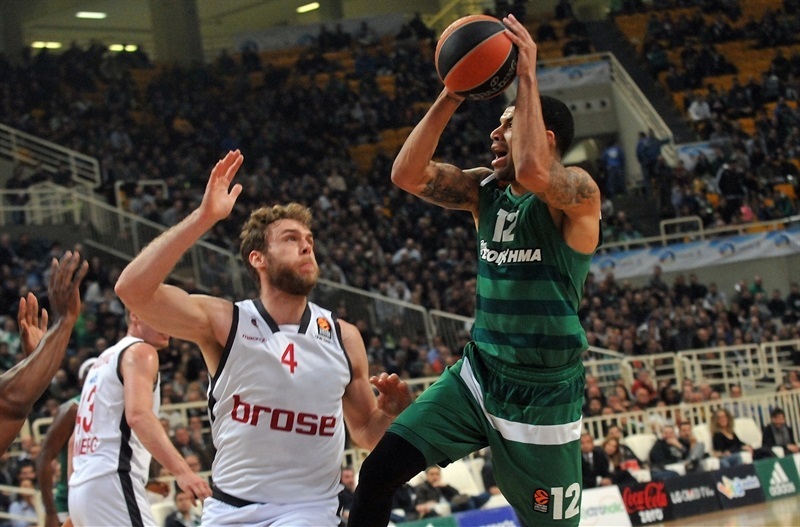 Panathinaikos Superfoods Athens registered its seventh consecutive home win, downing Brose Baskets Bamberg 81-72 on Thursday night in the Greek capital. 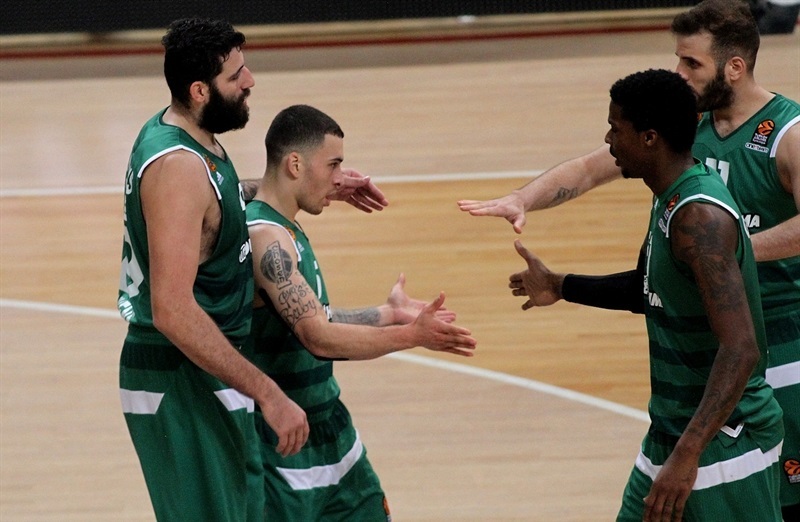 Panathinaikos improved to 13-9 on the season and now has sole possession of fifth place in the standings. Bamberg's record dropped to 8-14. 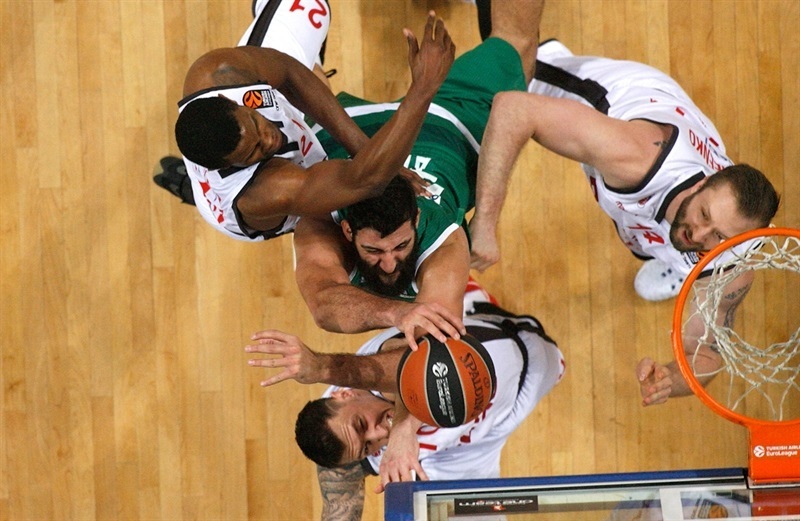 Panathinaikos controlled the game and built an 11-point lead in the second quarter, a nine-point margin in the third, and an 11-point lead again in the fourth quarter. 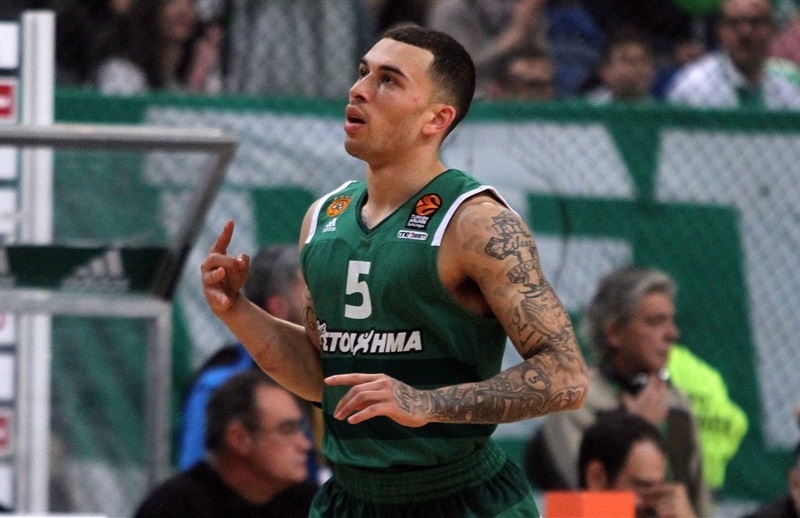 But Bamberg kept coming back each time before Mike James scored key baskets that helped Panathinaikos take another cushion and get to victory. 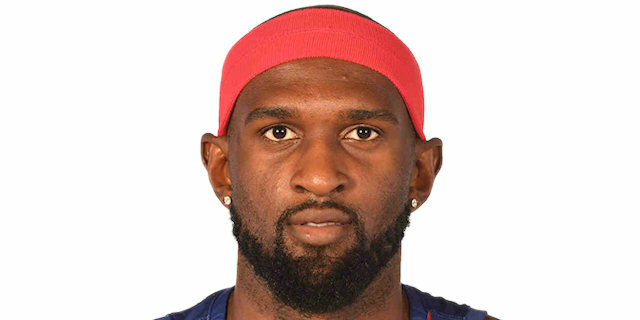 Chris Singleton collected 17 points and 6 rebounds for Panathinaikos. 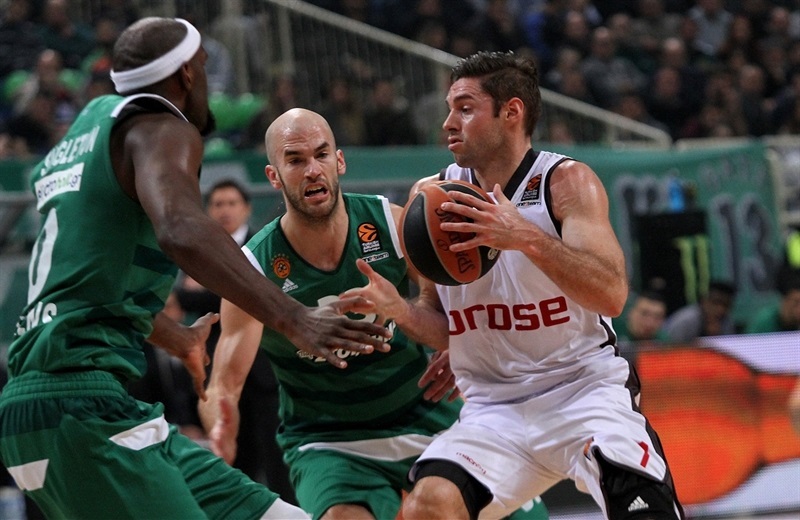 Ioannis Bourousis and James Feldeine had 16 points apiece, and James finished with 15 points for the hosts. 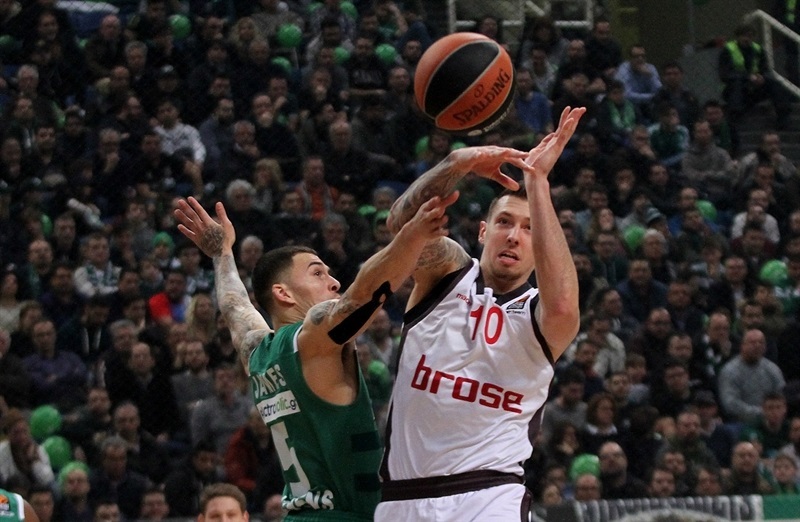 Daniel Theis had 18 points in 18 minutes for Bamberg. 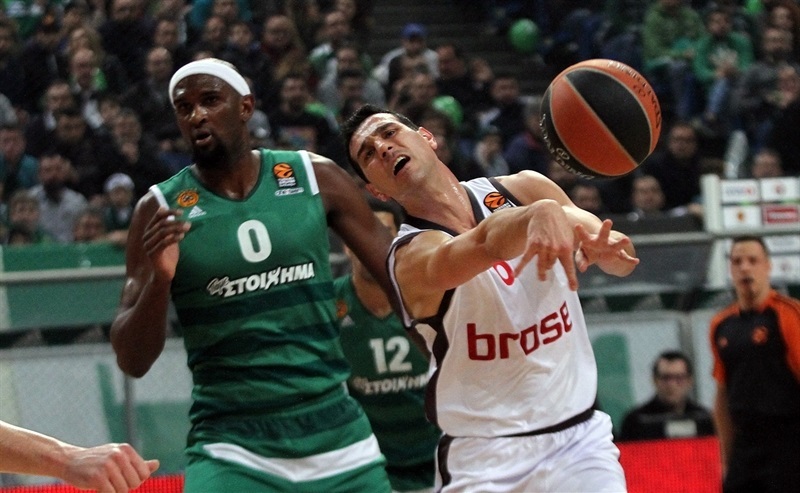 Darius Miller and Leon Radosevic each had 11 points, and Nikos Zisis netted 10 in defeat. Bamberg had a fast start to the game behind Radosevic, who scored 6 points and dished an assist for a corner three-pointer by Zizis that sent the visitors up 3-11. After a timeout, Panathinaikos took control. 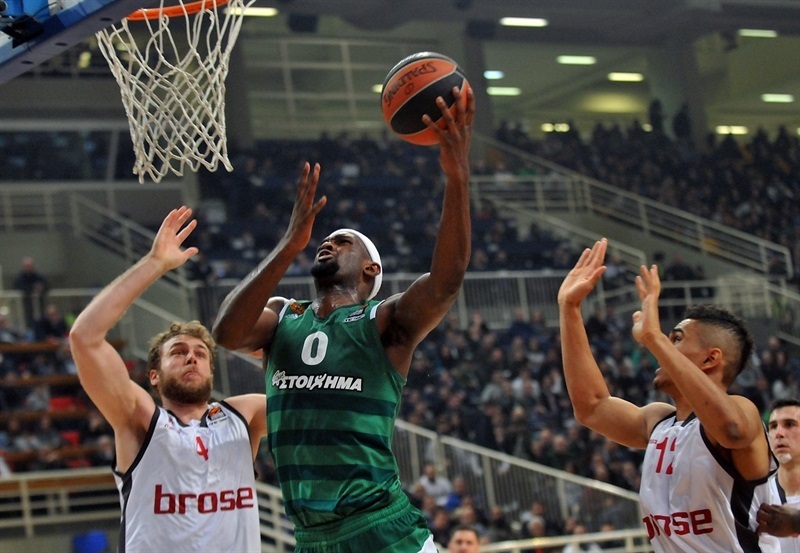 Four consecutive triples, a pair each Feldeine and Singleton, put Panathinaikos ahead 19-16 after only 7 minutes. Bourousis almost single-handedly increased the margin to 27-19 after 10 minutes, and Nikos Pappas had a three-point play that made it 30-19 at the start of second. Zisis and Patrick Heckmann hit threes for Bamberg, and with contributions from Radosevic and Fabien Causeur, plus defense that allowed Panathinaikos a single basket in more than 7 minutes, Bamberg tied it at 32-32. Heckmann's triple in transition put the visitors back in front 32-35, capping a 2-16 run. James nailed a long three and made a driving layup to put Panathinaikos back in front. 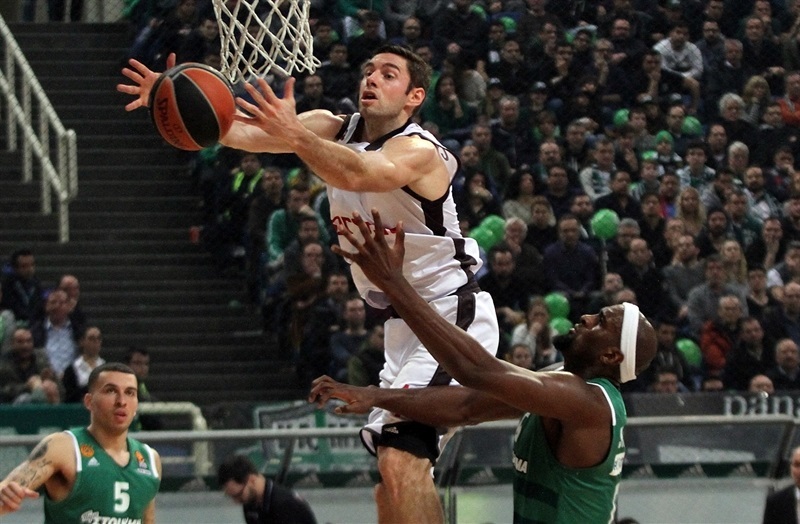 Feldeine added a step-back three-pointer, helping Panathinaikos to take a 42-41 halftime lead. After the break, Singleton and Feldeine hit triples from each corner to open a 53-44 advantage. Janis Strelnieks nailed one for Bamberg and Miller had a jumper that cut the difference back to 54-51. Bourousis was unstoppable inside during the third quarter, and James nailed a three. 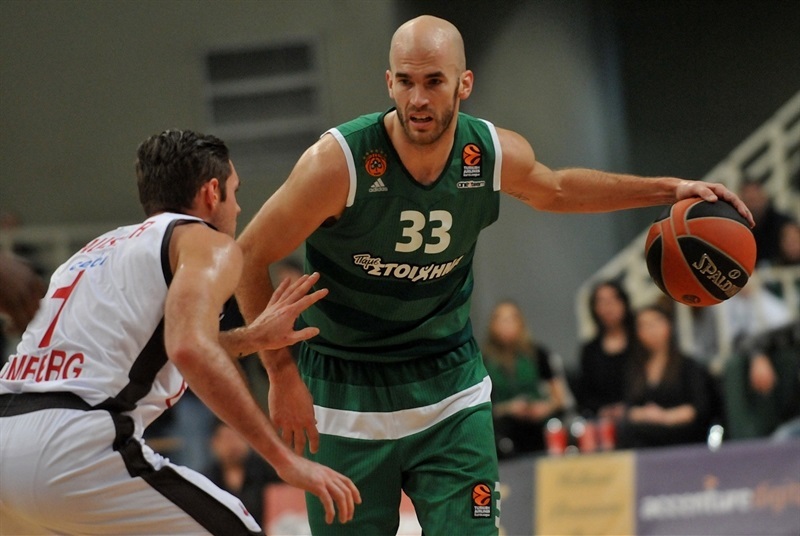 Panathinaikos had a 62-52 lead late in the third and opened it to 65-54 early in the fourth. But Bamberg, led by Theis rallied once again, getting within 65-61. After a Panathinaikos timeout, Kenny Gabriel hit a tough three, and James drove through crowds for a pair of layups, including one for a three-point play and a 73-64 score. 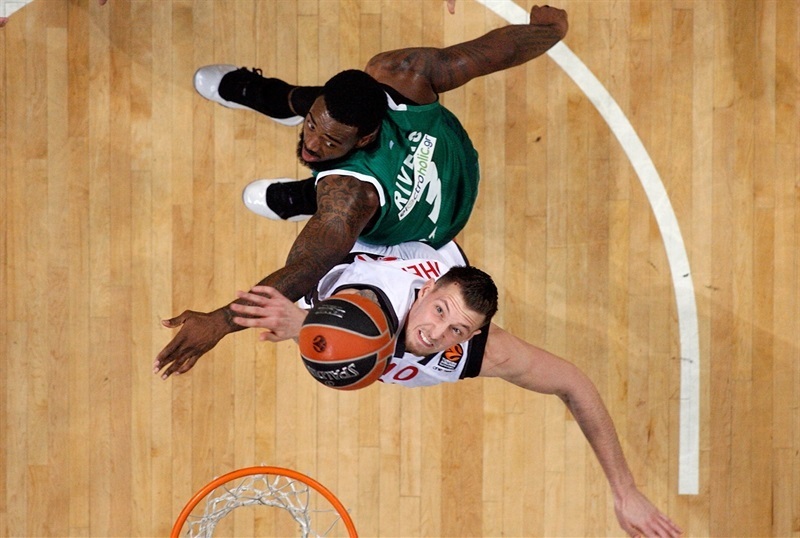 The margin soon reached 11 points once again, and there was no more coming back for Bamberg. "Intensity and physicality is the main thing for this team. That is one part of our identity, so we have to play every game with this concentration more or less on defense. Tonight we lost a big margin a couple of times. 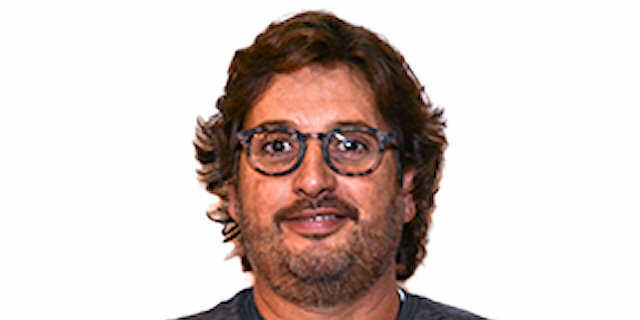 Two or three turnovers on offense, two or three rebounds on defense led to it, so it is very clear we have to improve in those kinds of things. This is an important win and success. We have to continue the same way, keep improving. The next game at home against Uncis Kazan will be very important for us and we have to win it." 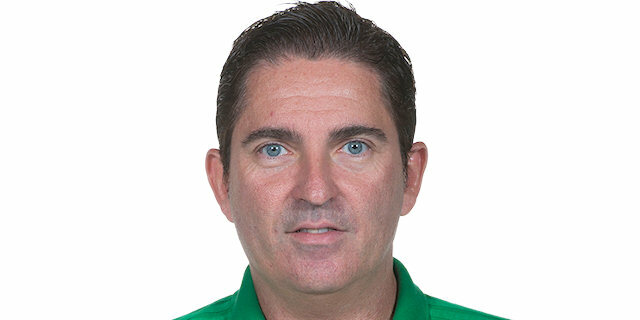 "We have a better index rating, we almost doubled Panathinaikos in assists, and we lost the game. Okay, in a low scoring game missing 7 free throws is too much. But we came with a solid game plan, executed well on Calathes, but we did not make big plays. To win in this arena you have to make big plays. Singleton made big plays. And big plays are on both ends of the court, on offense and on defense. Sometimes to win such a difficult game, against a team so solid in shooting, an athletic team, that has Bourousis, who was so effective inside, you need your players to put on their Superman clothes, their Spiderman suit. You need a big play. So, I will focus now on putting Avengers into my locker room, because that is the only way we can compete to the end against big teams. Make big plays. I cannot say to my team they did not execute the game plan. They were fantastic. They played great against one of the best point guards in Europe, they guarded very well against Rivers and Feldeine. So, as a coach I always have to find a solution for my team. So, we will work on big plays. That is the only thing we were missing tonight." "We played good. We lost a lot of hustle plays, but I am glad we got back to ourselves and played defense. I have confidence shooting. We get a lot of open looks, so I have to thank my teammates and point guards for that. Bamberg is a good team. There are so many games they should have won this year. That’s why everyone respects them. They still might make the playoffs. That says a lot about them."